Cabbage consists mainly of delicate, thin-walled cells that rupture when the moisture they contain freezes rapidly. You can freeze cooked cabbage rolls, but it is likely they will fall apart into a soupy puddle when reheating them. You have to start the freezing process slowly in the refrigerator, just like you have to thaw cabbage rolls slowly for best results. 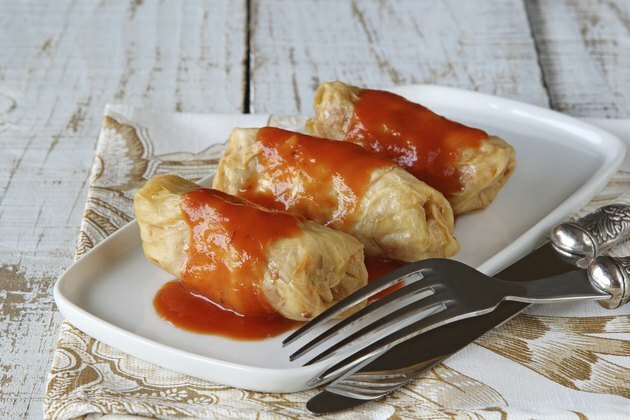 Place the cooked cabbage rolls seam-side down on a wire rack set inside a shallow dish or on a pan and let them cool to room temperature. Pat the cabbage rolls dry with a paper towel and place them in the refrigerator uncovered. Let the cabbage rolls chill overnight. Chilling the cabbage rolls uncovered in the refrigerator before freezing them is gentler on the cabbage than freezing them from room temperature and they reheat better as a result. Wrap each cabbage roll tightly in several layers of plastic wrap and twist the ends in opposite directions to squeeze the air out. Although even the most tightly wrapped cabbage rolls eventually frost over, the less air they come in contact with the longer they last. Place the cabbage rolls in a freezer bag or freezable container and mark the date. Use the cabbage rolls within 1 month for best results. Take the cabbage rolls out of the freezer and unwrap them the day before you want to reheat them. Place the cabbage rolls seam-side down on a plate lined with a few paper towels. Let the cabbage rolls thaw overnight in the refrigerator. Take the cabbage rolls out of the refrigerator and heat a few tablespoons of oil in a heavy-bottomed pan on the stove over medium heat. Lay the cabbage rolls in the hot oil and brown them on all sides for about 3 or 4 minutes total. Roll the cabbage rolls gently in the pan using your fingers or a spatula to brown them all over. Cover the pan with a lid after you brown the cabbage and lower the heat to medium-low. Let the cabbage rolls steam in the pan for 5 minutes. Take the cabbage rolls out of the pan and place them seam-side down in a serving dish. You can heat the cabbage rolls at 350 degree Fahrenheit in an oven instead of on the stove if you like. Arrange the rolls side by side about one-half inch apart in a shallow dish and heat them for about 12 minutes or until the inside reaches 165 F when measured with a digital thermometer.